I'm feeling a bit thick this morning and can't quite get it clear in my head. Would you mind clarifying things for me? As I understand your post, if you go over the threshold in a given week, let's say on a Wednesday, then you have to wait until the beginning of the next week (ie; Sunday or Monday) before you get your full speed back. Can this be true? Seems punitive. The various integration periods, 1 hour, 4 hours, 1 day, 1 week, 4 weeks are all sliding windows, recalculated every 5 minutes, and probably worked out by simply adding up the number of Mbytes in each 5 minute period for the last 12 periods (i.e. 1 hour), last 48 periods (i.e. 4 hours), etc. How long it takes to come out of the FAP will depend on when during the relevent period you used a lot of Mbytes. �As your oldest traffic records drift out of the back end of the window, your current total in the window goes down. The current Tooway FAP document, which was updated 14th Oct 2008, has a revised diagram which tries to explain this. �I hope my understanding is correct but I'm not sure. �It is not very clear, but perhaps better than it was before. I expect Skylogic will amend their FAP system based on experience. � Bentley Walker with their management of their�Hughes HX hubs have successfully adapted their FAP system (which is based on fixed 8 hour period and two different lower speed thresholds) so that the number of sites ever affected by the FAP is only a small proportion of all the sites, while achieving what they consider to be a fair sharing and keeping everyone happy. �Those affected by the FAP can easily see their stats and those of other FAP sites at any time and this open feedback has been well received. � I believe GlobalTT.com also operate some good customer traffic status pages on their Gilat networks, to give similar feedback to customers. I have had a look at the updated doc and I still dont get it what do the speeds on the left signfy? Does that mean it goes to 100kbps / 20kbps once in the FAP box? I don't understand it either. �There appear to be 13 x 5 minute periods in the first hour and 12 x 5 minute periods in the later hours. The sliding time window appears to be 65 minutes wide. The 22kbit/s, 100 kbit/s and the 20 MB and 25MB are unexplained. Are the 20 MB or 25MB the hourly limit for the basic service ? �No idea. Thanks for trying to explain the (apparently) unexplainable Eric. I have read the FAP posts above and realise that I may never understand the wonder that is FAP and I must just accept it and live within its awesome power. But I have one last question - �if the FAP kicks in after bad behaviour in a single hour and is recalculated every 5 minutes, then how did Aealden manage to cram in enough action to get put on the Naughty Step for a week? Surely the FAP would kick in and slow him down - at first for an hour, then for a day, long before he managed to build up a week of Jankers? 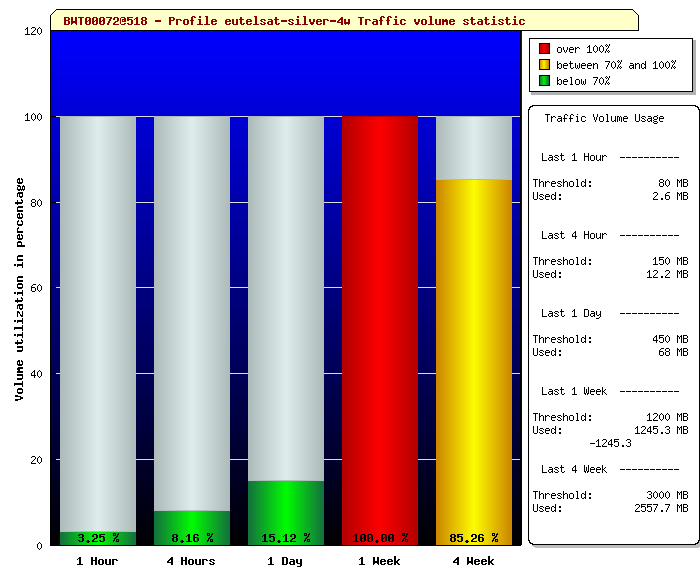 If you look at the traffic amount thresholds in the big example report for BRONZE tariff above. On the BRONZE tariff you could steadily download 6 Mbytes per hour for a week and exceed just the weekly threshold. If anyone on Basic, Silver or Gold tariff gets a traffic report please send it to me eric@satsig.net so I can show the thresholds here for the other tariffs. Compare with the BRONZE tariff at the top of this thread. Thanks for posting that Eric, I have upgraded to Gold to see if that will solve my FAP issues - I will post updates of how I get on. It is interesting to observe the -1245.3 Mbytes inserted below the exceeded threshold. �A question: Why is it -1245.3 and not -45.3 ? Assuming you were in this one week FAP state and �took another traffic record image 5 minutes later presumably the 1245.3 would have gone down a bit if you had been downloading during the 5 minute period ending exactly 1 week ago, and not doing anything during just the immediate last 5 minutes. Does anyone know of traffic monitoring software provide 5 minute records of traffic over the past month?. Crikey Alex - good effort. Saves us having to try it! If you can get a FAP shot, I'd be interested to see what the thresholds are for the gold system. I am still waiting to be upgraded to Gold. It seems that even this is not easy to do! I have been waiting for nearly a week - I chucked a bit of a wobbly this morning and it transpires that for gold service you are supposed to pay a year in advance! Although my provider is looking into taking this on for me. Should hear back by lunch. I don't think I can blame my provider for this one I think this is another bit of Sky Logic craziness. I remember the silver I needed to pay 3 months in advance. Is this normal in the satellite ISP industry? By the way, I have been unable to obtain an updated FAP graph since the last one. The one I did receive was not dated, and not emailed to me until several days after the event so it is virtually impossible to really make anything of it. By the way, it came on nicely on Friday but was off again by the end of the day. it has been unusable since. I am hoping that if they do manage to upgrade me to gold I might see some difference. Me Too Fritz Overworked and overstressed as a direct result of my Internet issues! OK that's handy to know, it seems slightly irregular to me. I am not sure I would be prepared to pay an unexpected 1200 Euros for 1 year up front, just for the privilege of upgrading my package. I already paid 3 months in advance which should be sufficient. --> Live info will be soon available. Skylogic is working on it. Great, do they have a rough date that we can expect this? Will it be this year? It would certainly be a big step towards a transparent and fair system. --> Its still very very very strange, we have no problems at all in the south of europe. We use a Docsis in our office for weeks now without any problem. Maybe you have a different FAP package, or have kept within your usage I don't know. Once I upgrade to Gold I hope all of my troubles will go away ! We will see..
have you been monitoring your internet usage with Netmeter or similar? On the day you got you service back, do you estimate you may have used sufficient bandwidth to become FAP'ed again? 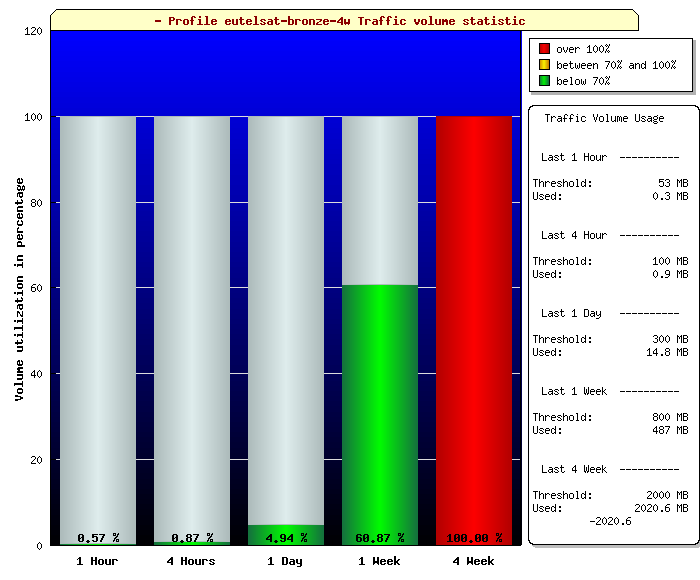 No I haven't been monitoring properly I must admit, it only came on for 1 day but it seems by comparing with my new usage chart I managed to blow 500 + mbytes in a day - thats with just web browsing and RDP... But the new chart clearly shows me in the red now for the 4 week period. I have been looking at the capabilities of my router so I will start restricting the sattelite connection to only my computer, and then log usage with net monitor for accurate results. What about you have you been monitoring? Have you found a way of prescribing so that you pretty much always have access without entering the FAP box? I have given up on the idea of gold, they want a year up front... so forget it! Here is the latest revision of the FAP diagram. There are now 12 x 5 min periods in each hour and the sliding window is 12 x 5 min wide. �The red recovery time is for 15 minutes (3 x 5 min periods). Time now is 1hr 20 min from the start time. I don't understand it. �Is there a limit of 20 Mbytes in 10 minutes causing a 100kbit/s restriction ? �Is so, this is not per the traffic graphs for BRONZE and SILVER. �Rather, more probably, the yellow line is just actual traffic useage and the area represents the Mbytes. Some clarification is needed for the first 10 minutes. I think the graph is supposed to represent a high level of traffic between 0 and 10 minutes, then 50 minutes of moderate useage. �The total for the first hour is excessive and speed reduction applied at the end of the first hour (at T=60m). �After 10 minutes the high level burst drops out of the window and the recovery period ends and you are back to full speed. Quite why you have to wait an extra 5 or 10 minutes is not clear. I don't understand the new yellow lines around the first 2hr 5m. I don't know what the 20 and 25 Mbytes are supposed to mean or what hourly threshold is supposed to be in force. �The BRONZE traffic had 53 Mbytes per hour threshold. A warning to anyone working on real-time C language code to implement a FAP system like this. �Think very carefully about the logic and make sure it all makes sense before writing the code. �Testing and verification of correct operation is very difficult. Hi, Since last night about 11pm and this morning (24/10) I am only getting 18kbps. I have only used 500mb of bandwidth in the last 5 days and none the week before as I was away from home with the computer switched off, yesterday I used 200mb and nothing in the last 9 hours. On the Wednesday and Thursday I was losing it totally and the modem was not locking. Is there anyone else having this problem? 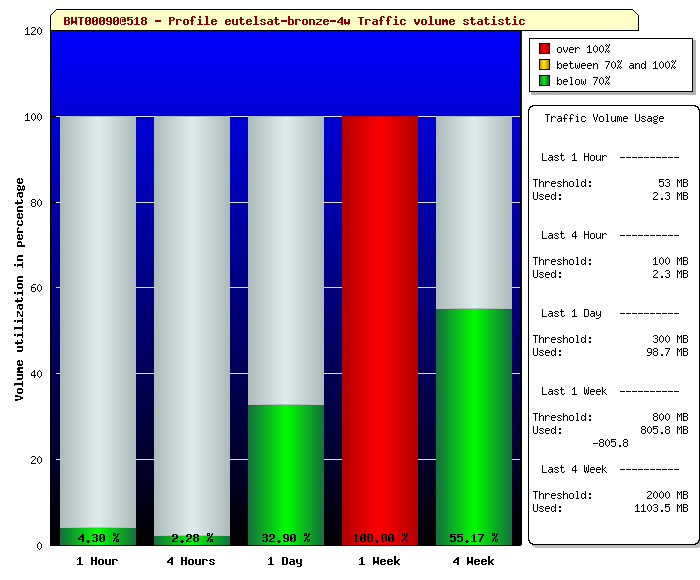 Please urgently ask your provider for a traffic graph so you can see what Mbytes threshold(s) you have exceeded. For the BRONZE and SILVER Tooway tariffs see the traffic graphs above (on page 1 of 2). �They show the Mbytes thresholds per hour, 4 hours, day, week, 4 weeks. � 500 Mbytes in a week may have caused some threshold to be exceeded. Was it raining heavily at your location when you lost service ? �Maybe it was raining heavily in Turin, but that would have affected all sites. Ka band operation is affected by rain but the size of the dishes should be sufficient to give a large link budget margin and make service possible in all but the heaviest rain. �Perfect centre dish pointing is important as the uplink beam is narrower than the downlink beam. �The top of the beam is 'rounded' and considerable skill is needed to find the centre. �Getting a 'good enough' downlink signal is quite inadequate. �You need to get to the exact centre of the beam (i.e. half way between two equally degraded levels on either side) and this final tweeking will make no significant improvement on the downlink. There was a maintenance on Wednesday evening, beside that no problems South of Europe. I did notice the service outage on Wednesday. This can be inconvenient since I often work from home (and on many occasions outside business hours). Of course I appreciate there will be planned downtime but I would assume that Skylogic give advance warning of these outages to you the suppliers? This would be a great help and allow us end users to make alternative plans (ie in my case staying in the office). I had a Traffic Volume statistic a few weeks ago and It gave me. Unfortunately I am with T****m and and trying to get an answer to anything is virtually impossible, but I will give it a go. but this is clearly not the case, if it were we would all know how we stand. Did your tariff have a name ?, Like Silver or Gold ? Your figures don't seem to line up with the others. Maybe Tooway are adapting the thresholds based on initial experience. Hi, It says Bronze. I cannot see how to upload it to here. I am still running at 18 kbps and I have written to T****m but nothing so far, There's a surprise. - Grade of service documentation with clear explanations of the FAP principle. The portal requires development in conjunction with the operator and at present clients will still have access to their graphs via BW or ther resellers. We thank you for your patience whilst we work on the development of this facility. Please direct any queries or suggestions to me james at bentleywalker.com. Yesterday speeds went back to normal and today things have hit an all time low of 10 down 4 up after only using 100mb in a day. Still no answer from T****m regarding why. FIP! what FIP?? Above (I have asked Eric to post it !) is another graph issued about 8 days ago. I started the service around the 22nd spetember... and if you look futher up the page a graph was issued on around the 12th october showing me at allready 2.5gb usage. around this time it went off completely and came on for 1 day of rock solid internet and has been off ever since! Can anyone give me a guess as to when it might come back on? I dont even pretend to understand that sliding window graph. I am still on 10Rx/4Tx. I have received a graph saying I am 20Mb over my 4 week limit and I am on FAP. Surely that should bring me back to full power after a day as there is a 300Mb threshold per day which should put me 280Mb in credit but I have been down for 2 days . I also certainly do not understand this sliding scale and have no idea when I will be back to full power. Copying your format I have put my own data in there. This was issued 8 days ago. I just had a go at sattelite and its crawling still. So from your understanding when should I be back of the naughty step? Hi, I am not absolutely sure, but assuming you are allowed a maximum of 450Mb per day and you are 20Mb over your 4 week limit then "Logically" it should take 1 day maximum from the date of the printout to be back within your limits as you woul be 430Mb's in credit, assuming that you have not used up much bandwidth since the printout. I say 'logically' but I am not sure if it is calculated logically! I would think Eric knows more about this than me. My guess is that it is how the 2020 Mbytes was distributed across the past 28 days that matters. If you did no downloading between 25 and 28 days ago then you may have to wait at least 3 more days. If you downloaded 30 Mbytes on the day 28 days ago and none today, then tomorrow you will be down to 1990 Mbytes in the last 28 days and up to full speed. I am not an expert on this and am partly guessing based on the FAP document. � I am pleased that Skylogic and the Bentley Walker are working on getting the customer intrface working. �I think they will also give an enhanced explanation of how the fair sharing arrangement works. � My option is that the method makes good sense, but I would expect that the thresholds and time periods be reviewed over time to optimise them. �Do we need so many different sliding windows ? �Is the shape of the curve of the allowances realistic ? How is the status best displayed ? A tiny multi-bargraph icon on the bottom screen bar would be nice. Following the campaign on this web site, Bentley Walker have been working to develop their own on-line web customer accessible portal to enable customers to see their traffic useage versus the Mbytes thresholds for the various sliding window time periods applicable to the tariff selected. �It has not been easy and the development of the software and web interface have proved quite difficult.